The Louisville nursing home abuse and neglect abuse attorneys of Nursing Home Law Center LLC are committed to combating the current rise in cases of abuse through education and legal action meant to hold negligent nursing homes accountable for the misdeeds of their managers and employees. One of the best ways we can discourage the practice of placing profits above patient safety is to encourage families to conduct more research into the history of any home they are considering for their loved ones. Avoiding facilities with long histories of abuse will not only protect those who you care about, but it will hurt these facilities in the place that seems to matter most— their bottom lines. Throughout the year, Medicare routinely collects data on every nursing facility in Louisville, Kentucky based on information gathered through investigations, inspections and surveys and makes the information public. The publicly available database reveals that investigators found serious deficiencies and violations at thirty (45%) of the sixty-six Louisville nursing facilities that caused injury or premature death to residents. If your loved one was injured, abused, mistreated or died unexpectedly from neglect while living in a nursing facility in Kentucky, you have legal rights to ensure justice. We invite you to contact Louisville nursing home abuse & neglect attorneys at Nursing Home Law Center (800-926-7565) today to schedule a free, no-obligation case review to discuss a financial compensation lawsuit. Founded in 1778, Louisville is one of the oldest cities in the United States located west of the Appalachian Mountains. It hosts the Kentucky Derby each year and is home to the headquarters of KFC, Louisville Slugger and the United Parcel Service’s worldwide air hub. Its roots to the transportation industry grow even deeper as the founding city for the Louisville and Nashville Railroad. Its diverse economy and culture has made the city home to more than 256,000 residents; many of which are retired or about to retire. With an aging population representing over 16% of the population, Louisville’s senior population is proportionally larger than most cities in the nation. It is for this reason that the city is home to so many nursing facilities. Seniors also have access to two senior centers, which offer activities ranging from card games, competitive sports, dances and other social events. The Flaget Senior Center is located at 4425 Greenwood Avenue while the Wilderness Road Senior Center is at 8111 Blue Lick Road. For more information about the services provided by each senior center and to sign up for events, you can visit https://louisvilleky.gov/government/parks/senior-services. Our Louisville nursing injury lawyers wish that we could provide comprehensive reviews of every nursing facility in the area, but due to the vast number of homes, we can only focus on the lowest rated facilities. We hope that providing these ratings and information about the violations committed by these facilities will help you avoid placing your loved ones into poor environments and would like to encourage you to perform your own research on homes not listed. You can do this using the nursing home compare tool provided on the Medicare website located at https://www.medicare.gov/nursinghomecompare/search.html. Primary concerns: This center’s poor rating is driven by understaffing, poor quality measures and numerous health inspection deficiencies. Many nonprofit facilities are struggling to keep up lately because of draconian budget cuts made to senior programs over the last two decades and these cuts have taken their toll on this facility’s ability to maintain reasonable staff levels and address patients’ concerns. Primary concerns: Despite an excellent staff quality rating, this facility received an overall rating of one star from Medicare. The reason is an abysmal health inspection record coupled with poor quality measures, calling into question how much attention is actually given to matters such as hygiene, environmental safety, disease prevention and patient comfort. Patients here may also be at increased risk of suffering from medication errors and not being provided with individualized treatment plans tailored to their needs. Primary concerns: A one star staff quality rating indicates a lack of investment in quality staff members, but this is unsurprising in the nursing industry’s current state of affairs. Many for profit centers minimize their staffs to the bare minimum required to operate and the patients suffer as a result. Staff members themselves are overworked and rushed as they attempt to provide for the needs of every patient. What is fundamentally wrong with this practice is that we are often forced to pay an exorbitant amount of money for our loved ones’ care only to find out that administrators and owners have little to no concern for providing quality care. Primary concerns: This facility received a one star rating in all areas of assessment. Its health inspection history is riddled with deficiencies and violations, it barely employs enough staff members to remain operating and its quality measures leave much to be desired. Primary concerns: The Golden Living Center is a for profit nursing home chain that has committed such egregious offenses in the past that it has gained national renown due to the lawsuits levied against the chain in the past. It should come as no surprise that its policies extend across all of its home and these policies include cutting expenses through staff reduction while paying minimal attention to quality measures. This facility has received two stars or lower in all areas of assessment as a result. Primary concerns: This facility has a higher staff quality than most on our list, but its staff is still considered mediocre by Medicare’s standards. Its quality measures and health inspection scores are concerning, with numerous safety violations and an obvious disregard for patient concerns. Primary concerns: As the third Golden Living facility on this list, this center exceeds the others’ levels of ineptitude with one star scores in every single area. Its health inspection record is unacceptable and quality measures completely inadequate. All of these things stem from an overworked and understaffed staff. Primary concerns: Like its counterparts, this Golden Living Center facility suffers from considerable understaffing and health and safety concerns have surfaced as a result. To make matters worse, its quality measures rating is a single star. Primary concerns: Numerous safety violations, nonexistent quality measures and an overworked staff have created a recipe for chaos at this facility. Residents are at a considerable risk of suffering from neglect, contracting communicable diseases and having their concerns and health factors overlooked by a staff that is stretched thin on time and resources. Primary concerns: With quality measures and staff rating scores of two stars, this facility is not as poor as some of the others on our list, but this is not a crowning achievement. Understaffing and lack of attention toward patient concerns have contributed to an unacceptable health and safety rating, making this home unviable as an option. Primary concerns: A one star health inspection rating and two star quality measures score are the primary drivers behind this center’s low score. Its staff quality rating of three stars is considered acceptable, but leaves plenty of room for improvement. Primary concerns: As is common with nursing chains, the problems with one facility tend to surface at others. In a similar fashion to its sister facility, this location suffers from an abysmal health inspection rating, two star quality measures score and understaffing concerns. Primary concerns: A mediocre health inspection history is all that this nursing home has going for it. Its staff levels and quality measures are worthy of concern and reasons to avoid placing your loved one under this center’s care. Our Louisville nursing injury lawyers are on call to discuss concerns you may have about your loved ones’ care and can even assist you in relocating them if you feel they are living in an abusive environment. Many of our clients have difficulty distinguishing signs of abuse from the symptoms of common neurological disorders senior are prone to develop, so we can help you look for the telltale signs which absolutely cannot be ignored. Some of them include the following. The development or worsening of bedsores. Treatment and prevention of bedsores is very simple and if nursing staff are unable to ensure that your loved one is repositioned on a regular basis to prevent these sores or do not even notice they are there, this is a sign of neglect. Regardless of whether the neglect is willful or simply because of overworked caregivers being unable to tend to the needs of all of their patients, the nursing facility needs to be held to account. Sudden changes in behavior. While it is possible for your loved one to suffer from dementia, senility or other neurological changes, a sudden change in behavior should raise a red flag. Angry outbursts, depression, mood swings and paranoia in the presence of caregivers are all signs for concern. Unexplained infections or illnesses. The development of an infection could be a sign of poor disease prevention measures, inadequate hygiene or other negligent care. If your patient has an infection that worsens because staff do not notice or report it, the infraction becomes even more serious. Dehydration or malnourishment. Signs of poor nutrition and hydration include unexplained weight loss, darkened urine, lightheadedness, confusion and weakness. Physical signs of restraint or abuse, such as bruises on the arms, legs or genital areas. Physical and chemical restraint measures are not legal without consent, but caregivers will often break the rules to control unruly residents. 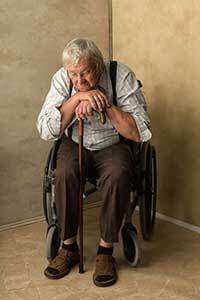 Nursing Home Law Center LLC represents nursing home abuse victims across the nation and may be able to help you determine the appropriate course of action for your loved one. Our first priority is your loved one’s safety, so we will help you determine whether he or she is the victim of abuse and help you remove him or her from the situation if that is the case. From there, we can seek compensation from the offending nursing facility for its negligent policies and the behavior of its staff. Contact us today to arrange a free consultation with an award winning Louisville nursing home abuse and neglect attorney so that we can collect the information we need to investigate your claim. We will review all of your legal options with you so that you know what to expect if you decide to proceed. Since all of our attorneys work on a contingency basis, you are also assured that our services will be free of charge until we’ve recovered compensation on your behalf.